When the wise men from the east see the star, they know that Christ the King has been born. N THE COUNTRY far to the east of Judah there lived some wise men who studied the stars. One night they discovered a new star in the sky, one that they had never seen before. 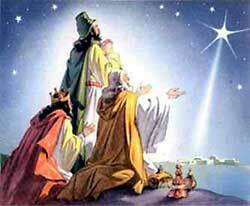 And God caused them to know by this star that Christ, the promised King of the Jews, had been born. These wise men feared God, and they wished to see the child whom he had sent to be the Savior of the world. They supposed that the Jews must be very happy because God had at last sent to them the King he had promised. Because these wise men were rich, they planned at once to make the long journey to Judah and bring precious gifts to the new-born King. Then they would worship him as their Savior. For many days they traveled across the sandy desert, and at last they came to the fertile country where the Jews lived. They hurried on to the city of Jerusalem; for they expected to find the wonderful child living in the most beautiful place in the land. And surely Jerusalem, the famous city of the Jews, would be the most beautiful place. Herod, the man whom the emperor of Rome had set up over the land of Judah, was living in Jerusalem at that time. He was surprised when these strangers, riding on camels, came into his city and asked, "Where is the child that is born King of the Jews? We have seen his star in the far east country, and have come to worship him." Herod had heard nothing about this new-born King, and he was troubled. What could this mean? he wondered. And even the rich people in Jerusalem were puzzled, too. They had heard nothing about Jesus. No doubt the wise men were disappointed when they found that the rulers of Jerusalem knew nothing about the birth of the Savior. Perhaps they feared that they might have been mistaken, after all. But they waited anxiously while Herod called the chief priests and the scribes and asked them where the Savior should be born. Now the chief priests and scribes were the men who read the books that the prophets had written long ago, and they understood that Christ should be born in Bethlehem. This they told to the excited Herod, and he called the wise men and told them that they should look for the child in Bethlehem. Herod had been troubled, because he did not want Jesus to become the king of the Jews. He thought this new-born King would take away his throne, and he wished to be king himself. But he did not let the wise men know about his trouble feelings. He called them and asked very politely when they had first seen this unusual star in the east, and they told him. Then he urged them to hurry on to Bethlehem and search diligently to find the child. "When you have found him,' said Herod, "bring me word at once, that I, too, may go and worship him." And with these words he dismissed them from his presence. The wise men mounted their camels again and took the south road, leading to Bethlehem. All they had waited impatiently in Jerusalem, and now the shadows of night were falling over the land. But it would not be a very long ride to the birthplace of the new-born King, and, urged on by Herod's words, they hastened to find Jesus. When once outside the city gates, they saw the star, the same beautiful star that had shown so brightly in the east country, moving slowly before them, as if leading them on to the right place. Now they were sure that they had not been mistaken; and they rejoiced greatly, for they believed that God was in this manner trying to help them to find Jesus. When they reached Bethlehem the star stood still over the place where Mary and Joseph were living. And the wise men knew they had followed the right guide, for here they found the wonderful child of whom the prophets had written. They knelt in humble worship before him, and then gave to him the rich treasures that they had brought from their homeland. God spoke to the wise men in a dream one night while they were in Bethlehem, and warned them not to tell Herod that they had found Jesus. So they returned to their own country by another road, and Herod never saw them again. Not long afterwards an angel of the Lord spoke to Joseph in a dream and said, "Arise, and take the young child and his mother, and flee into Egypt, and stay there until I bring word to you to return again; for Herod will seek for Jesus and try to destroy him." Joseph rose up at once, and while it was yet dark he took Mary and the baby Jesus and hurried out of Bethlehem. For many days they traveled to the southwest, until they came to the land of Egypt. There they lived until an angel came to tell them that the wicked Herod was dead. But Herod did not die for some time after the visit of the wise men. He waited long for them to return, bringing him word from Bethlehem as he had commanded them to do. But when many days passed and they did not come, he began to suspect that they had gone home without telling him of their wonderful discovery in Bethlehem. He believed they had guessed the reason why he had been so eager to see Jesus, and now he was angry because he had missed the opportunity to find the new-born King of the Jews. Determined to destroy this King of the prophecies, Herod commanded his soldiers to go to Bethlehem and kill every baby there from two years old and younger. Not only to Bethlehem did he send them, but to the country places round about. And when this cruel deed was done he believed that he had surely gotten rid of this child whom the wise men sought to worship. But all the while Jesus was living in safety among the people of Egypt, and fast growing out of his babyhood years. Then the wicked Herod died, and an angel came again to speak to Joseph, telling him to return with his wife and her child to their own land. Joseph was glad to receive this message from the angel, for he loved to live among his own people. And he started back to Bethlehem. But when he came into Judah, he heard that Herod's son was now the ruler of the Jews in Judah, and he feared that this new king might be cruel like his father had been. Because of this fear Joseph journeyed on to Nazareth, in the country of Galilee, where he and Mary had lived before Jesus was born. And there he made a home for his wife and wonderful child.